Here are some excerpts from the popular travel guide used by all of the most adventurous mermaids! It is being made available to humans for the very first time. Descriptions are available for the polar regions as a whole, the Antarctic, and the Arctic, as well as some discussion of local culture. You know the phrase polar opposites? Well, the poles transcend such simple human conceptions. Polar opposites; the poles are located on opposite sides of the planet and share the accompanying cold climate, with long summer days and long winter nights. This is the land of the midnight sun, but also of days and days of darkness. Unlike the tropics, which face the sun directly, the poles only see the sun in sidelong glances. In the winter, it’s just a little peak of sun over the horizon, and then it’s time for a very long night. Summers are bathed in light but still frigid. But the regions are more than mirror images. The Antarctic is a vast landmass with the south pole near its center, surrounded on all sides by the wildest ocean; the Arctic is a sheltered sea containing the north pole, surrounded by land. First, the bad news: there’s a lot of land. 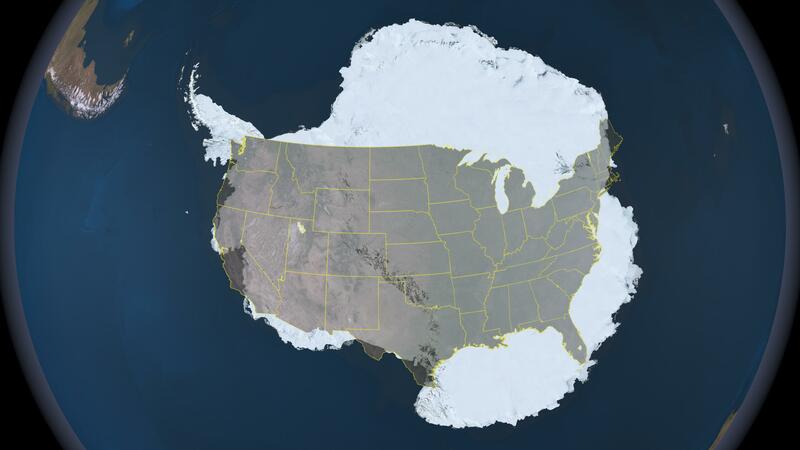 Antarctica is about a third larger than the United States (image credit: nasa.gov). That land is covered in ice from countless snowfalls, nearly three miles deep at its thickest. If some enterprising mermaids were to shovel all of that ice into the sea, it would raise sea level by 200 feet. At the present, most of the ice sheet is stable, with the western part melting and breaking into the ocean a bit more than usual since humans started changing our atmosphere. 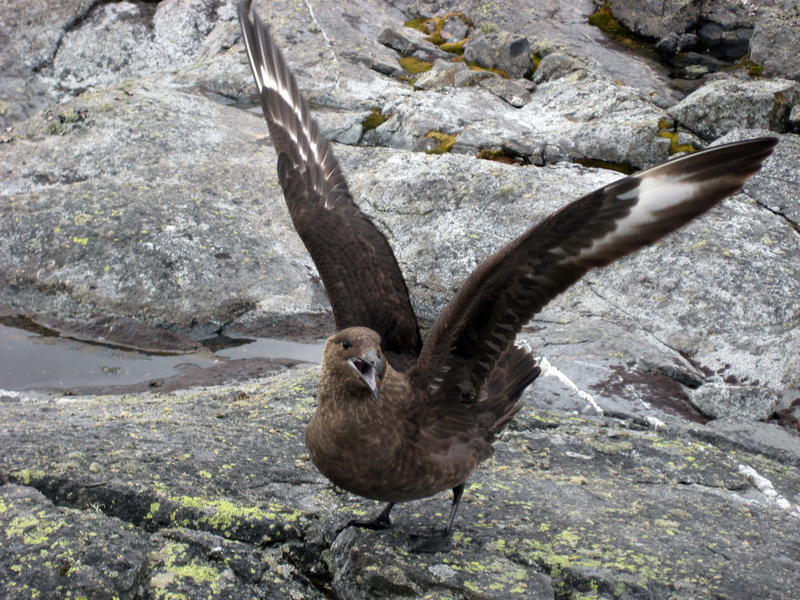 Skuas – they’re big, loud birds with a great sense of humor and a flair for acrobatics. 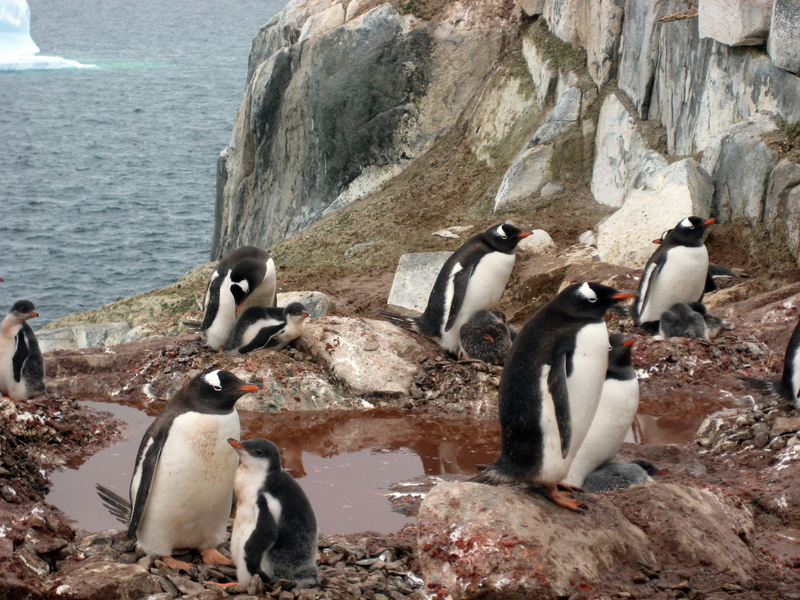 Antarctica was dreamed of by humans for millennia, but they didn’t actually see it until 1820. Towards the end of the 1800’s, they started really exploring the area, providing quite a show for the mermaids. Antarctic mermaids are known for being unusually fond of humans, possibly due to the incredible bravery they witnessed in 1914 when Sir Ernest Shackleton led a group of explorers through terrible danger. 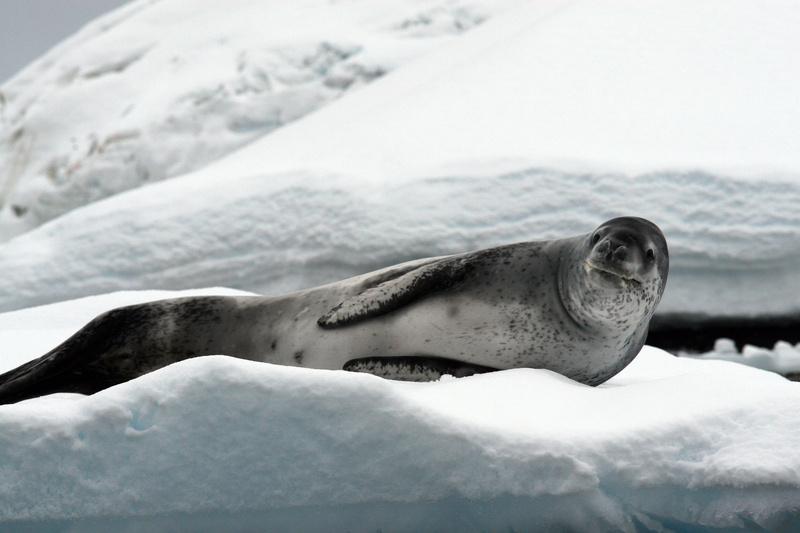 While the Antarctic is dominated by land, the Arctic is dominated by the sea. But it’s not the open ocean that we mermaids are used to. This ocean is covered with a layer of sea ice formed when the seawater froze. Each year the ice grows in the winter and melts in the summer. The ice reflects sunlight, keeping the earth cool. 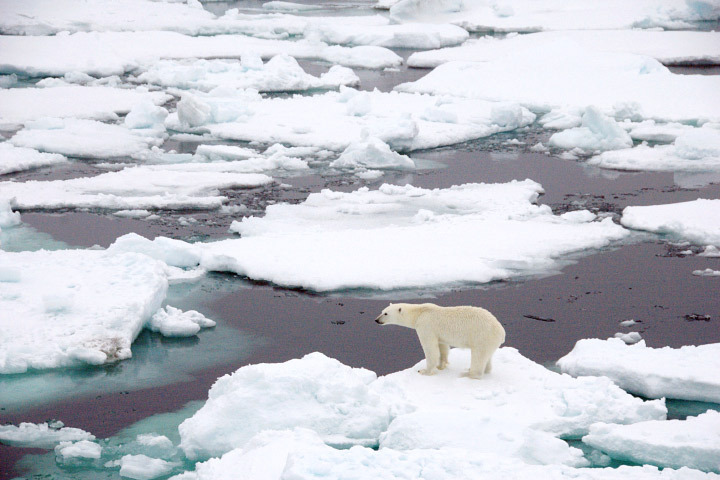 Recently, there’s been less sea ice as a result of global warming. Even humans – usually quite dense to the workings of the sea – have realized that this loss has far reaching implications for the inhabitants of the area and for the entire planet. 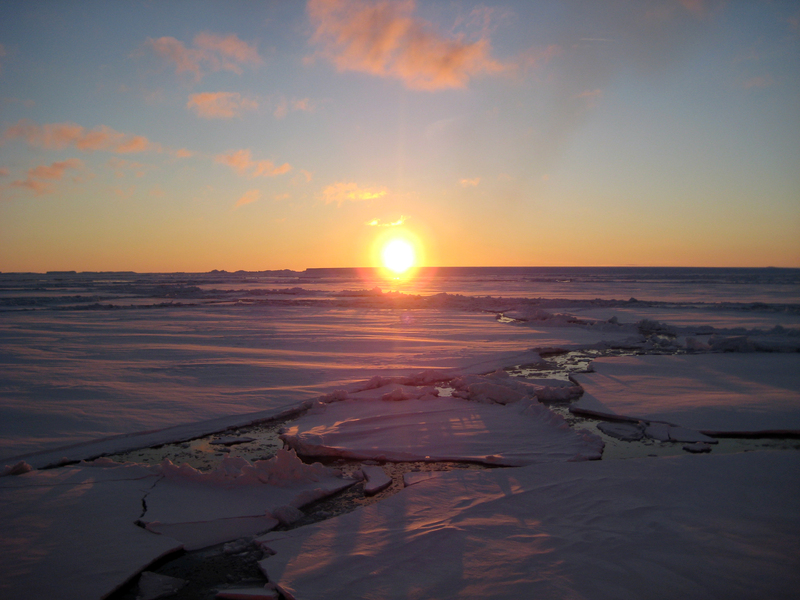 Once sea ice melts, it can no longer reflect sunlight. This further warms the ocean, and it annoys mermaids who are trying to sunbathe in the reflected light. Humans have explored and inhabited the arctic for centuries, at first staying on the land ice that sits on the continents surrounding the iced-over sea. In modern times, that land is claimed by many different groups of humans. Much of the exploration centered around the attempt to find the so called “Northwest Passage” that would allow humans to cross the Arctic Ocean with their boats, rather than riding an armoured bear across (as any self-respecting mermaid would do). Those men struggled to find a passage that only existed in their dreams. 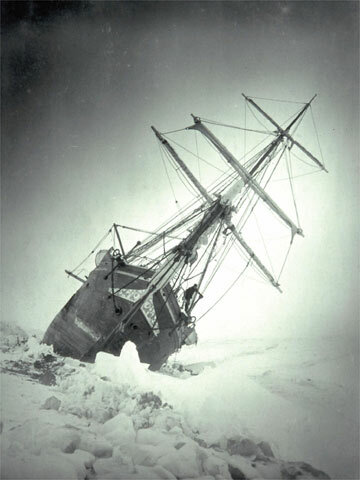 But it was a dream of the future; global warming will soon melt enough ice to allow ships to pass even in the summer. In addition to sea ice, there is some land ice in the Arctic as well. It comprises the Greenland ice sheet, a one-mile-thick layer of compressed snow that has fallen through the ages. If the Greenland ice sheet were to move from the land to the ocean – through the shoveling of industrious mermaids, melting from human-induced global warming, or any other method – sea level would rise by 20 feet. Many mermaids choose to travel back and forth between the polar regions, swimming quickly through the warmer waters of the tropics. The poles are where deep water forms, and consequently mermaids bathe in those waters to think deep thoughts. Long days and long nights also mean that polar mermaids throw some of the most epic parties imaginable, never worrying about sunset or sunrise putting an end to the festivities.